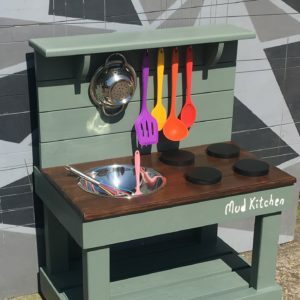 This kitchen is designed to be mounted on a wall at any height and so it is wheel chair friendly and perfect for taller and older children. The kitchen comes with a wooden wall mount that is easily fixed to a wall and all of the screws and bracket are included. This model is the nursery sized 2 bowl and hob, but you can choose the 3 bowl or 2 bowl version. Engraved lettering *Please limit this to approx 42 characters. Caution: We will engrave exactly what is written with 'Mud Kitchen' appended. 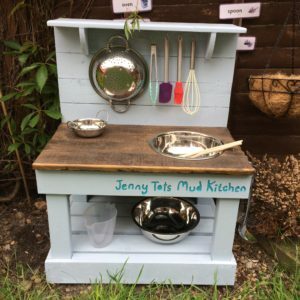 The Mounted Mud is wheelchair friendly and can be wall mounted at any height so also perfect for older or taller children. 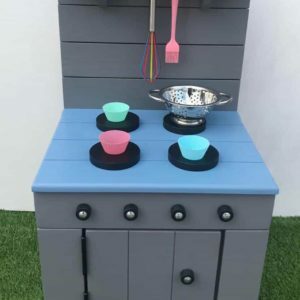 This kitchen is a bespoke product, individually personalised and made to order so delivery is around 4- 5 weeks from payment. 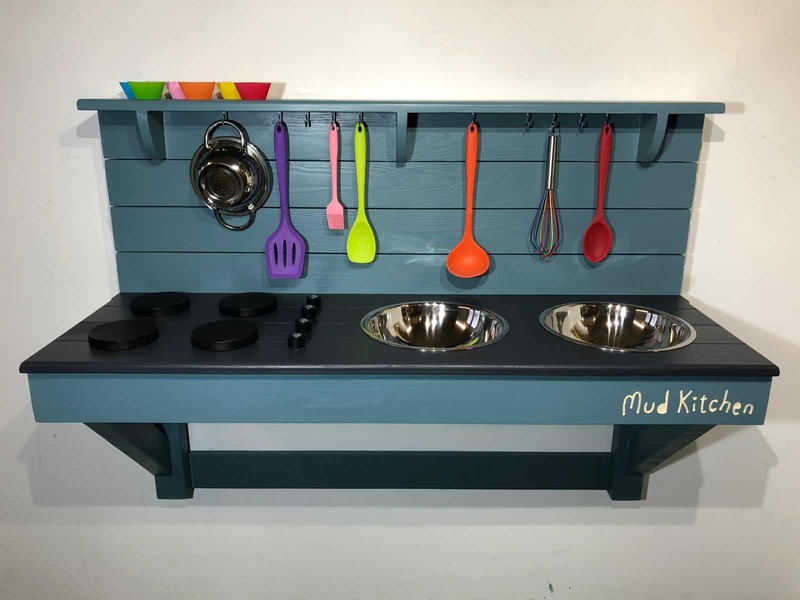 This kitchen has 2 mixing bowls, a 4 ringed hob, 4 movable cooking knobs The kitchen is fully weatherproofed the kitchen is painted with 2-3 coats of the Cuprinol garden range in a colour of your choice. you can choose from a stained plywood or painted plywood work surface. Kitchen dimensions: width 119cm,, depth 50cm, back shelf height 40cm, height can be set at any level with this model.